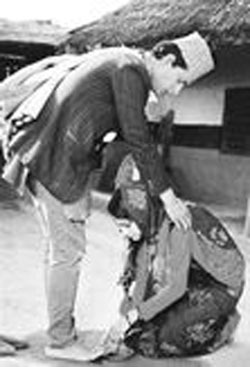 (Left) Actor Deepak Tripathi and Usha Poudel in “Muna Madan.” Courtesy of Desitalk.newindia-times.com. Perhaps the first indigenous Nepalese film to be considered by Hollywood, “Muna Madan” represents Nepal's first attempt to sever ties with Bollywood in hopes to consolidate its own identity. Muna Madan, the second Nepali film to vie for the Academy awards, is based on the tragic love story of one of the most famous pieces of classic Nepalese literature by Laxmi Prasad Devkota. The film tells the story of Madan (Deepak Tripathi), who is forced to separate from his wife, Muna (Usha Poudyal), and family to go to Lhasa and search for work to pay off debts to the merciless moneylender (Neer Shah). During his absence, an admirer tries to lure Muna with gifts but she is insistent on her fidelity. After facing many difficulties during his journey and his stay in Lhasa, Madan returns home only to find his mother bed-ridden and on the brink of death, which provokes the neighbors to help the ailing woman by offering a cow to the Brahmin priest (a traditional Hindu rite performed before a person's death). Muna's rejected suitor makes another attempt by sending her a fake letter informing her of her husband's death causing atrocious results. Madan, already emotionally torn by his mother's passing away, discovers that his faithful wife is also gone and causes him to grow weak and hopeless. He asks his sister to repay the loans with the small fortune he made during his trip and to take charge of the household as he dies uttering the name of Muna. Muna Madan narrowly beat Bijaya Chalise's Muktidata, a big contender at the recent and biggest Kollywood Film Awards, to be chosen to represent the country at the Oscars. Gorkhali Online (11-28-03) states that the selection was based on a “thirst for a national identity.” Sudeshna Sarkar's article in Desi Talk (India Times News) states that an unidentified Nepalese producer feels that Nepal has a long way to go when it comes to the Academy Awards though producer Dhakal hopes Muna Madan will find some success in the international arena. “However, irrespective of what fate has in store for Muna Madan, the nomination itself is bound to give some impetus to the Nepalese film industry that, until recently, was in the doldrums due to a dispute between producers and cinema owners,” a dispute which halted the screening of Nepalese films in Kathmandu's cinemas that showed only English and Hindi films. The cost to make Muna Madan was Nepali Rs. 6 million (approximately US $80-83,000), a huge investment in one of the world's poorest countries. Besides the lack of financial means, Nepal's film industry contends with technical drawbacks. Directors usually go to Mumbai for recording music due to the lack of studios in Nepal and also to subtitle films. Sudeshna Sarkar notes in the Deccan Herald (9-28-03): “Muna Madan, though the second entry to the Oscars from Nepal, is in a way the first fully indigenous film to go to Los Angeles. In 2000, Caravan made on the ancient yak trade in remote Dolpa district with an all-Nepalese cast, many of them first-time actors enacting their own lives on screen, was sent to the Academy Awards. It was among the top five foreign films nominated for the award.” However, the director of Caravan is a French documentary filmmaker, Eric Valli, whose reputation and contacts furthered the progress of the film at the Academys and helped finance the project. Nepalese directors do not thrive on producing films based on current issues like the Maoist insurgency or the anti-government opposition because of the country's censorship restrictions. Lakshminath Sharma, another veteran director and the president of the Film Director's Guild of Nepal, notes that when director Narayan Puri made a film on the Maoists, it was so harshly censored that he practically had to re-shoot the entire film. He says that “No one makes movies for society.” Instead, producers and directors stick to cheap commercial films for financial reasons. However, Lama indicates that the only reason a Bollywood director wants to release his film in Nepal is to make a profit, not to serve the Nepalese society. He firmly urges, “We have undoubtedly learned from Hindu films but now, since we have our own industry, let us try to make our own."